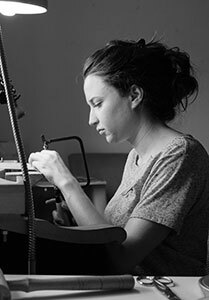 I am a jewellery designer born 1985 in Austria, currently based in Istanbul, Turkey. I attended a traditional four-year-training as a gold and silver smith at Abteigymnasium Seckau, Austria. For one and a half year I volunteered at the Viennese goldsmith Ilga Zeman. I started to work conceptually in Istanbul 2013 by taking classes for two years at Maden Istanbul with artists Burcu Büyükünal and Selen Özus. Additionally, I attended “Colour on Metal Workshop” by Anastasia Kandaraki and “Wax Workshop I and II” by Catalina Brenes. My jewellery pieces represent small parts of the search of giving visual forms to my inner stories and emotions. While working I submerge myself for hours into a world where there is only myself, my feelings and stories, and find ways, techniques and forms that are an expression of this inner world. During my creative process much depends on chance, but nothing in the finished piece is chance. The finished jewellery must make complete sense for me and includes all I want to express. A piece emerges with uncountable layers that reflect parts of myself which I completely understand with my heart but which is difficult to put into words. I like simplicity, purity, raw form and natural materials. I want to create jewellery which the person who wearing it doesn`t find only decorative, but which also causes certain emotions, a piece that is not just ornamental but grows dear to their heart.